My parents migrated to Australia from Greece in the 1970s, and I was born in the early 1980s. Apart from an early stint in Melbourne’s north, I mostly grew up in the western suburbs of Melbourne, about 28 years of that spent in Altona North, and the last three and a bit years in Sunshine West. Vocationally I’m a drifter, to the point where I’ve spent most of my adult life in university study, only recently finishing a doctorate which saw the end of my status as a career student. Over the past five or six years I’ve also taught some literary studies units at Victoria University, mostly taking tutorials and occasionally doing some lecturing. My interest in football started with television, and my dad taking me to games. Most of my friends growing up were into Australian Rules (I barrack for Collingwood), or not into sport at all. 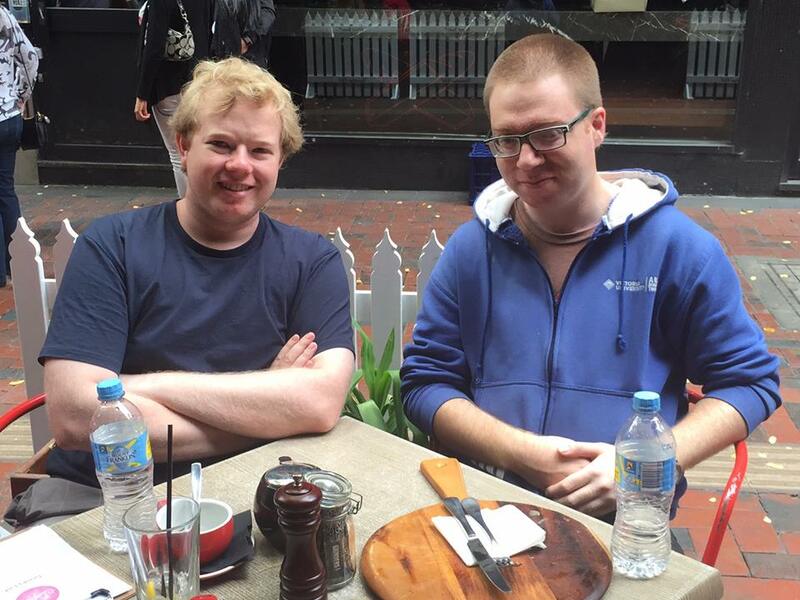 My brothers, who I’m very close to, have no interest in sport. Pre-internet, reading local Greek newspapers kept me in touch even when I wasn’t going to games. My football pedigree is minimal. I wrote the following disclaimer on my blog in 2011 when it came to my attention that some people might care about my footballing pedigree or lack thereof. I’ve never played a junior game. I’ve never played a senior match. I’ve never coached. My experience as a player is based solely at a very social level. The highlight of my career was accidentally dribbling past about three players in a supporters match held at Lakeside Stadium. I was so surprised by this occurrence, that I fluffed a five metre pass at the end of the move. I watch a lot of local soccer, and I like to think that I’ve picked upon on a few basics of tactics and such, but I’m no tactician, I’m no athlete, and I don’t claim to be. My earliest memory of watching soccer was on television when I was five or six years old, circa the late 1980s. I remember an SBS closing credits montage when they used the “soccer is the real football” song, and I say it must’ve been around the 1980s, because I remember an Inter player celebrating and 1989 was the last time they won anything for a long time. In the flesh, the earliest game I can remember attending would be the 1992 Hellenic Cup final between East Altona PAOK and Clifton Hill, at Paisley Park. The game finished 1-1, and PAOK won 3-0 on penalties. PAOK being a low division team at the time compared to a lot of the bigger Melbourne Greek teams, it was a really big deal for the club to win the tournament, and it was its biggest achievement up until that point. Years later, when writing my thesis about Australian soccer literature, my dad told me he’d written a poem celebrating the occasion which was posted in the clubrooms. I found his drafts of it, and added that poem (and a translation) to my thesis’ appendix. 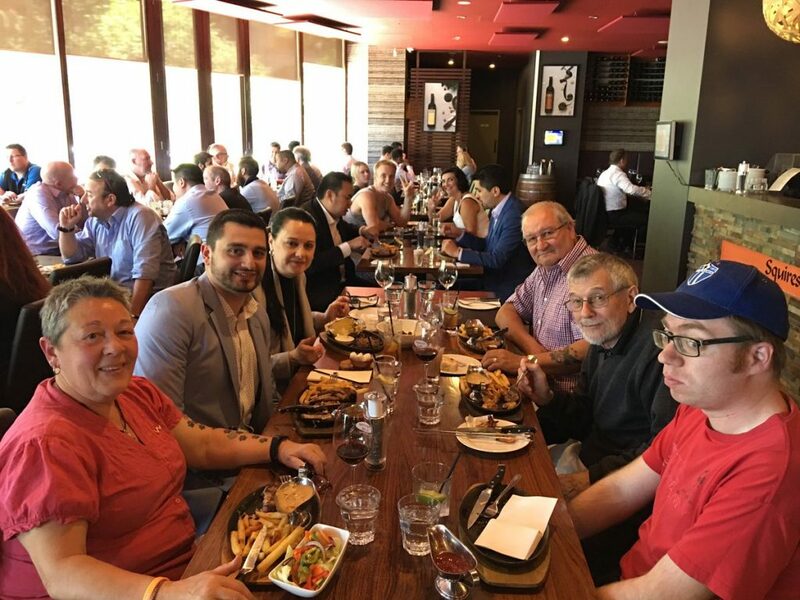 I first came into contact with South Melbourne Hellas when I saw what I think must have been a replay on TV of their 1991 grand final win over Melbourne Croatia. My dad was a Heidelberg United Alexander supporter, but he was late getting me into that particular cult, and you know how kids are, they like to pick winners, and I picked South and for the most part that was that. 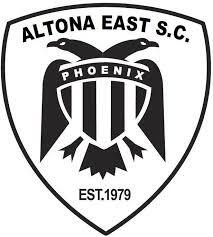 I went to my first South game (that I can recall) in late 1992, at Middle Park against West Adelaide Hellas, we won 4-2 and it sealed the deal. For the next ten years or so I went to a handful of NSL games a year, usually with my dad, and less often with an older cousin. For all sorts of arcane reasons, I didn’t get to nearly as many games as I would’ve liked to during the NSL. After the NSL finished, I fell away from the game entirely for a year or two. I tried to get into Melbourne Victory during their first season, but it didn’t take. Instead that experience reinforced the fact that I was a Hellas fan. In 2006 I recommitted to South in a big way, and haven’t wavered since. I get to most games home and away, as many pre-season games as I can, and the odd interstate game when the planets find themselves in alignment. Apart from reconnecting with something in a deeper way than I had before, South has been at the centre of my mental and social rehabilitation. I was out of work for three years after a failed uni stint, I had few friends, and I was depressed. Coming back to South changed that. 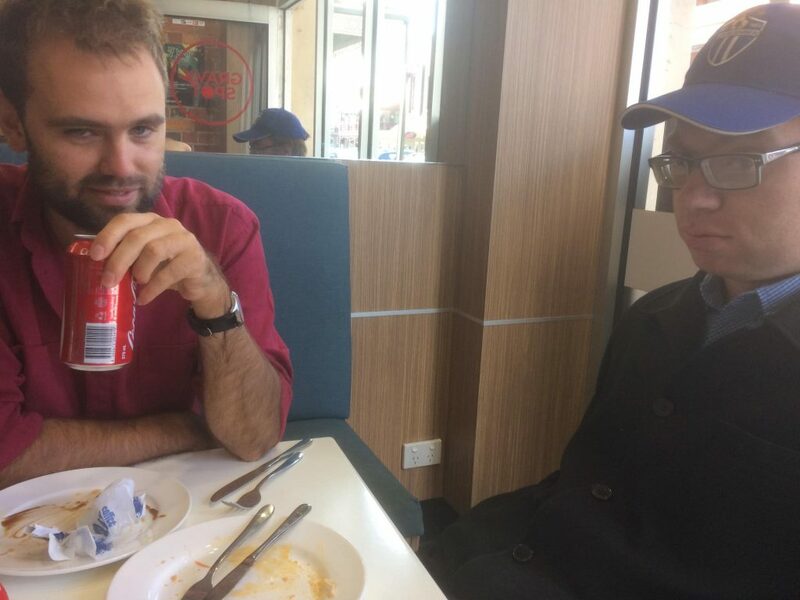 I made new friends, and I got back into university, found the things that I am kinda good at, and a lot of that has to do with being at South Melbourne. In hindsight the muted arrogance of those goals is beyond embarrassing. But I persisted in part because I was doing a professional writing degree at the time, and it seemed like a good place to practice my craft. I learned a lot from doing that work, got some good advice along the way, and the writing quality has improved considerably. The blog is generally morose in tone, but not always and hopefully not insufferably so. It seeks to question the wisdom of authority but also the madness of crowds. It takes its flights of fancy as well – I review soccer films and books, I discuss examples of Australian soccer literature, academic conferences, soccer meetings, South’s AGMs, other games that I go to – it’s not only about the weekly grind of being a South fan. And as much as it’s worthwhile talking about what happens on the pitch, as I said earlier, I’m no tactician – so my specialty becomes talking about the cultural experience of being a South fan. And in the end, I have had an influence on Australian soccer’s public discourse, on discussions about South, and some South fans have taken the opportunity to contribute. How much influence I’ve had is impossible to measure though. My reader numbers in general remain small, unless a post is on a topic of broader interest, because not many people are interested in South these days, and I’m a pretty poor self-promoter. But privately I’m aware that some pretty important people read what I write, and even if they don’t always agree with me, they think my opinions are valuable. Of course, the journalist Joe Gorman saw enough in my ramblings to quote me and use me as a character in his The Death and Life of Australian Soccer, which is quite flattering; so one way or another, I’m part of Australian soccer history now. Apart from South of the Border, I’ve also written for a handful of other soccer publications, most notably Goal Weekly (match reports, round reviews, and opinion pieces) and Shoot Farken (most notably my Heavy Sleeper’s World Cup feature). Outside of soccer writing, I’m on Football Victoria’s Historical Committee. I’ve done the odd piece of volunteer work at South Melbourne – everything from putting sponsor signs up on match day, to doing ground marshal work, to preparing and selling memberships. Outside of South or the blog, if someone wants to interview me for a school or university project about South or Australian soccer more generally, I do my best to make myself available if I think my expertise is suitable for what people want to do. I have an anorak’s tendency towards trivia and ephemera, but without the necessary work ethic or commitment to make it a worthwhile obsession. I initiate or get on board with projects when there’s no one else doing anything, until the point where better qualified and/or more dedicated people make themselves available, or I get bored, whichever happens first. More formally, I got into Australian soccer history when I read Wikipedia’s entry on the National Soccer League, and found that it was pure anti-ethnic/old soccer rubbish. Combined with working to improve the South Melbourne Wikipedia page, it was the way I got my foot in the door of doing this kind of work. And I recommend anyone that has an interest in Australian soccer history to tinker – responsibly – with Wikipedia, because as much as people like to dismiss it as a source of knowledge, it’s a great place to get a feel for writing and compiling history. After that, I got involved with OzFootball, mostly with the Victorian club database. The backend of the site though is in html, and thus cumbersome to work with, and because of that my enthusiasm fell away over time. But I did manage to create the site’s Futsalroos result database from scratch, which is the thing I’m most proud of from my time working on OzFootball. More recently, as a sideman to my friend, Australian soccer historian Ian Syson, I’ve begun co-hosting an Australian soccer history show called ‘If You Know Your History’ on Football Nation Radio, and that’s been going pretty well so far. 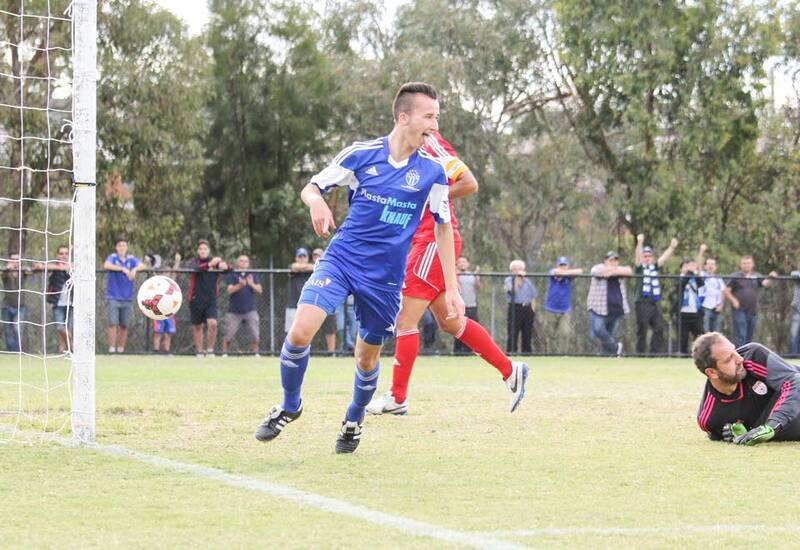 FFA Cup vs Whittlsea Utd – Paul celebrating in the background arms raised. My most memorable fan experiences are the backs-against-the-wall wins in the middle of winter in some suburban outpost, shared with the handful of people who love South Melbourne Hellas as much as I do. As for people I’ve met… I’m no celebrity hunter, so I don’t go out of my way to meet people with a pedigree. But due to my status (for some people) as the one ‘normal’ old soccer fan writing about what it’s like to follow a former national league team now, I have had the chance to discuss issues with a range of interesting and sometimes famous people. Being in Joe’s book gave my limited notoriety an extra boost. I hope to see the A-League fold, so that we can return to purely state based competitions played in winter, with an end-of-season tournament to decide a national champion if people feel that such a thing is really necessary. 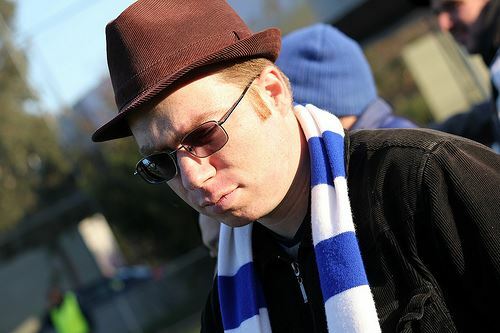 If the A-League doesn’t fold, then I usually don’t pay any attention to it, unless the league’s behaviour has a direct influence on the fate of South Melbourne, in which case the effect will almost certainly be deleterious and thus I will respond in a typically caustic fashion. I think that promotion and relegation is an insane idea that cannot work in Australian soccer, but there are people out there who are determined to prove me wrong and more power to them, especially if they end up destroying top-flight Australian soccer in the process. If pressed, I’d say that a standalone national second division would make more sense than promotion-relegation, something along the lines of Australian basketball’s SEABL competition; but since SEABL has now been discontinued despite its longevity and relative popularity, that’s hardly a model one can bank on. However, while making what I hope are nuanced (but really probably just adolescently pessimistic) observations on what my combined understanding of Australian soccer history, Australian top-flight sports franchising, and anecdotal observations of Australian sports fans may say about the likelihood of pro-rel working in Australia, remember this: I have no business nous, no sport administration background, and no relevant expertise in any field that would see me making an extended argument of any value to this debate. So unless you have a predilection for the kind of cynical hot-takes published mostly for the sake of posterity, you’re probably better off reading about these matters from other people. 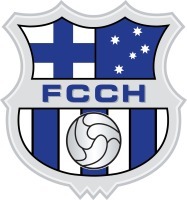 If you follow me on Twitter for soccer purposes, you’ll get the following: South Melbourne Hellas commentary, Victorian soccer junk, some historical stuff, and pithy observations on the state of the game. But the soccer content gets overwhelmed by my other interests, especially because I use Twitter more as a curated news, education, and entertainment service than as a self-promotional device – so there’s retweets of news articles and all sorts of other things which reflect my interests. And if you were the kind of person who only likes one sport, or especially only one code of football, you’d get frustrated with the copious references to footy during the winter. I don’t follow a lot of #sokkahtwitter people. I follow people who I find funny, people who I find interesting, and people whose politics and general internet manner aren’t completely objectionable. When I follow #sokkahtwitter people it’s usually because they also have interests beyond soccer, because my idiosyncratic taste in soccer – pretty much limited these days to Victorian soccer – means I don’t have much to say on anything outside of that. Soccer is only one of the things I do to occupy my time. Conversely, the best thing about #sokkahtwitter is when I meet people in real-life who have read my work or who I have interacted with on Twitter, most of whom are just really nice people who exist beyond the limitations of the carefully cultivated characters they are on social media. Now seeing as how I don’t follow overseas football leagues or the A-League, and having what is at best a passing interest in international football, it means that I kind of exist outside of the present and future concerns of the game as well. I’m OK with that, and as long as I have my club, I couldn’t care less. And if I didn’t have my club, I’d move on from the game, having made my peace with the situation a while ago.